10 Top Tips for staying at Riad Soufia. We chose this Riad because we wanted to explore more of the Medina (old town) of Marrakesh, with out having to take a shuttle bus from the hotel everyday into town. It was the best decision we made. The location is great, once you get your bearings. So here’s a little guide to help you, when you stay at the Riad: Take a right directly out of the Riad, a right again. Follow this alley until you reach an opening where cars are usually parked. Directly in front of you there is a small shop selling water & other essentials, with a pathway to the right of it. Take that path all the way until you reach a T junction. At that junction, take a right to visit Jemaa el Fna, the main square. Or take a left to visit Bahia Palace (pictured below), a must see, with its lovely eateries and souvenir shops. Or stop at the restaurants at this junction, for some delicious food, before you explore more. 2. Book a Dinner or Lunch, made by Halima. We were a bit unsure whether it would be worth it but I am so glad we did book the dinner. Halima prepared a wonderful meal for us. Which was presented beautifully in the dining area (although she actually volunteered to take up to the roof terrace). It was great to chill in the Riad that first evening after a long journey with the kids, meal made, everything cleared away for you. Perfect. I even used up the left overs the next day. 3. Book a Transfer from the Airport. This again was a little more expensive but I think it’s worth paying that extra, to get to the right place. Worry not, there is usually someone there to help with your luggage, although you will need to around pay 20 dh (£2) for the help. 4. 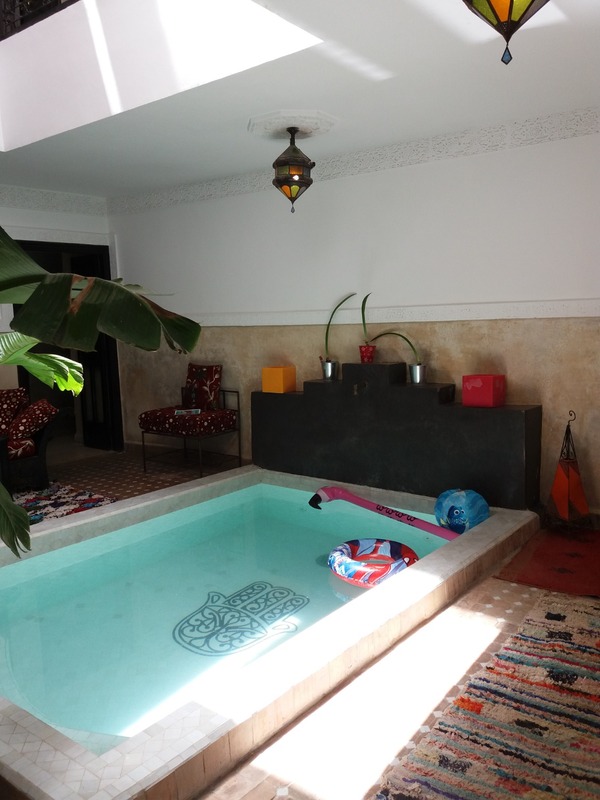 The Private Plunge tucked away in the Riad. The plunge pool is great although it wasn’t quite warm enough to plunge into a couple of the days, not that it stopped the kids. The one thing I must mention is that there is no guard rail around the pool, so you need to be vigilant if you have younger children. 5. Stay Connected whilst on Holiday. The Wifi is great and present through out most of the Riad. So you don’t have to disconnect from the World entirely. There is however no TV, so if you rely on a TV as a free babysitter do find alternatives. Our kids enjoyed the plunge pool & we did take their amazon devices along for the odd occasion of quiet time (for us that is !). Worth downloading some content from BBC Iplayer ahead of travelling or sign up for a free month of Netflix. They also loved playing hide & seek in a Riad ! 6. Perfect for Younger Kids. The bedrooms are all on the same floor. The lay out was great for us, since we have young children. I need to be in ear shot of my children & this certainly provided that security. Many other places have rooms across floors. So if you have young children like us (6, 6, & 4 year old), then this is a good place to consider. This place has quite steep stairs and would not be suitable for anyone with mobility issues, although the kids did manage the stairs. 7. The Terrace is Great for a Spot of Sun Bathing. The roof terrace is amazing. From what I can tell, it is not overlooked, so some private sunbathing is perfectly possible. The plunge pool is also not overlooked. So if you are looking for seclusion, this Riad offers it in abundance. 8. There are lots of places nearby to eat & little shops selling the essentials. If you are staying for longer, or need items like Pampers nappies, then you can catch a taxi to Maarjane. It is a huge supermarket selling everything you could imagine. OK, not everything but certainly everything we would expect to find in a UK supermarket and more. With a McDonalds on site & Pizza Hut nearby. It is also close to Palooza Land, a small dinosaur theme park. So you can always make a day out of your Supermarket shop. They do not sell alcohol or ham products at this supermarket, but Carrefour supermarket does, in Carre Eden Mall or Menara Mall. Also, great places to have a day out, particularly Menara Mall with its air-conditioned kids play area, panoramic views of Marrakesh & a mini ice-skating rink to really cool off. We even watched the Football World Cup Final at Menara Mall, since there is no TV in the Riad. Pictured below the KidZo at the Menara Mall. 9. No need to come back with a Suitcase of Laundry. The Riad has a washing machine and lots of space to dry clothes upstairs on the roof terrace. There is even a laundry basket, pegs, an iron & ironing board. So, if you are like us, and the laundry follows you wherever you are in the World, then you don’t have to take it all home with you. You can keep on top of it while on holiday, or not if you chose. The small shops have laundry powder in small bags to purchase although I just took some with me from home. 10. To Cook or Eat Out. They had all the spices you need to cook up a tagine or a curry in the kitchen. Although we never used them, it was a really nice touch. Whilst we did cook a couple of times at the Riad, there were plenty of restaurants near by to enjoy too. So those are my 10 top tips for staying at Riad Soufia. I am pretty confident you will enjoy the authentic experience that the Riad offers, because it is such a beautiful & well appointed place to stay. It is also looked after by a very helpful lady, Halima. She made our stay perfect. Why not join our Facebook group, the Family Holidays Club for the best holiday deals & travel tips.